Dane Best wound up to throw the first legal snowball in nearly a century in Severance, Colo. Monday evening outside Town Hall. 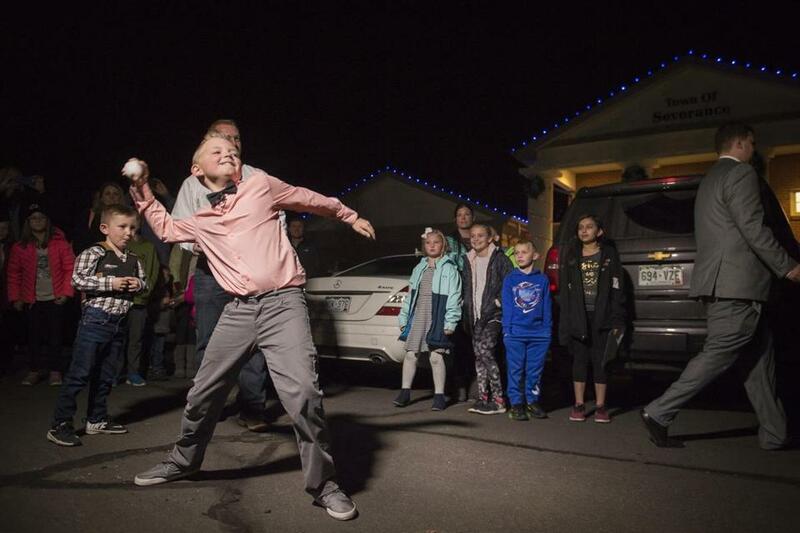 This week, a 9-year-old boy threw the first “legal” snowball in Severance, Colo. It was the culmination of a campaign that Dane Best had led to repeal a nearly century-old ban on snowball throwing in Severance, a town of about 6,000 people about 50 miles north of Denver. At the mayor’s office Tuesday morning, Dane fielded calls from news outlets from around the world with his mother, Brooke Best. To be sure, it is not entirely clear whether snowball fights in particular were illegal in Severance — at least not in the past decade or so — but the town encouraged Dane’s participation in local government. “My boys have been breaking this ordinance for nine years,” Brooke Best said. During his Power Point presentation, which lasted about five minutes, he decried the law as outdated.